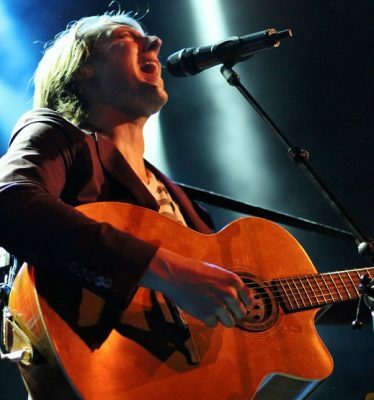 You can’t believe a word Eric Hutchinson says. Don’t believe me? See for yourself: his new album even admits it’s all Pure Fiction. Tall tales or no, I wanted to hear just what Mr. Hutchinson’s been up to since I saw him last, so I rounded up a couple girlfriends last night and headed out to the Fillmore to give him a listen. Shortly after we arrived, the “Tell the World Tour” support act Saints of Valory took the stage to kick the evening off. 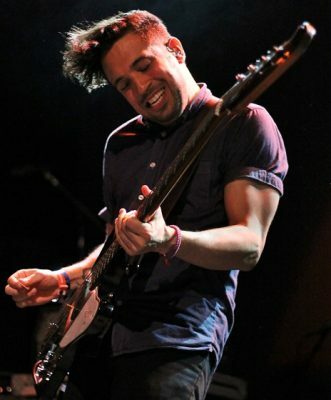 Saints of Valory’s Gavin Jasper jams on bass. SoV guitarist Godfrey Thompson soaks up the (lime)light. 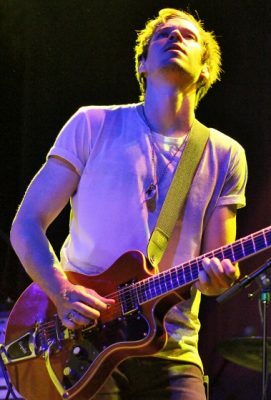 Shortly after 9pm, the lights went down and the crowd promptly began to scream, chanting, “Eric! Eric! Eric!” Taking the stage in the dark, Hutchinson made an entrance that was just the right amount of dramatic. He began at the keyboard with “Love Like You” from his newest album. “San Francisco, ready to get it cracking? You ready to do this?” Judging by the level of cheering that came back from the floor, they were. 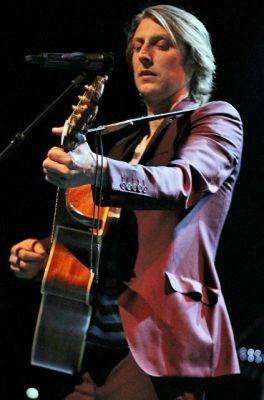 “Watching You Watch Him” came next, followed by “All Over Now,” after which he paused to “welcome everybody to the Tell the World Tour.” The next song was “Oh!” from his first album (Sounds Like This), and Hutchinson asked the crowd to join him in singing the chorus, as he often does at live shows. 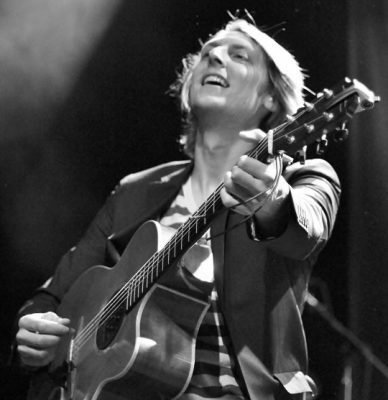 Eric Hutchinson split his time on stage between guitar and keys. “Thanks for comin’ out tonight! We’re a few weeks into the tour,” Hutchinson explained. “I can already tell this is gonna be the best show we’ve ever done here.” He went on to tell a little story about his new record, or more specifically, the song he wanted to play next. He admitted he’d never gone to sleep-away camp as a kid, and that he felt “bad for myself.” Impressively, though, he took the opportunity to make up for lost time by “going to adult sleep-away camp last summer.” He wasn’t kidding, he insisted, calling it the “best thing I’ve ever done,” and saying that it was “so serene” and that he pictures it “when I’m having trouble sleeping.” I was listening, I swear – but whether he wrote the next song to evoke the feeling “like I’m sitting around a campfire singing ‘Kumbaya,’ but with better lyrics” or specifically to hold on to actual memories from his grown-up sleep-away experience, I somehow missed. At any rate, the song was “Goodnight Goodbye,” and before he even got started, Hutchinson stopped himself and addressed the crowd honestly. “Here’s the deal, guys. This is the most vulnerable I’m gonna get all night.” He went on to say that if people insisted on talking, he couldn’t do much to stop them, “I guess.” More importantly, he encouraged those nearest the talkers to “give the person next to you a look like, ‘what the crap, man? '” I hope they did, wherever it applied. The song was great, and I always respect little pockets of honesty like this one from an artist. “I’d like to send this one out to all of our pals at Pandora,” Hutchinson said before the next song, “Back to Where I Was,” which featured his backup singer, Jessie Payo on one of the verses, as well as Hutchinson’s guitar player on another verse. “This song… I haven’t decided yet…” Hutchinson trailed off. “It’s definitely about waiting, but I haven’t decided yet if it’s about waiting for a lover, or for a drug dealer…” The song, “A Little More,” could in fact apply to either situation. This is definitely one of the best things about seeing Eric Hutchinson live: he’s a great musician, and I enjoy what he does, musically. Live, though, he’s got such great comedic timing. I always enjoy his dry, witty sense of humor. “All day, all night, we’re gonna set the party off right,” he chanted between songs, eventually leading into “You Don’t Have to Believe Me” and a little of the Isley Brothers’ “It’s Your Thing” in the mix, too. 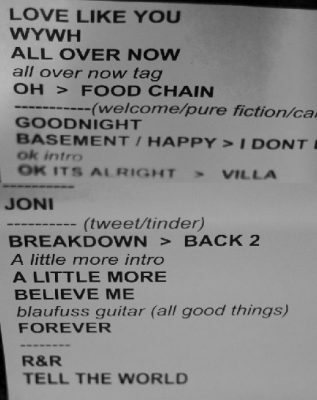 Before I had much time to register the end of his regular set, Hutchinson and the band were back for the encore, starting with the “na na na”s of “Rock & Roll,” which was every bit as catchy and excellent as I’d want his biggest hit so far to be when I hear it live. “Thank you so much for coming out tonight, everybody!” After a quick introduction to the members of his band, Hutchinson closed with the tour’s title track, “Tell the World,” which features the fantastic line “I”ll make you wish you were here tonight,” and at least for my friends and I, he did just that. “I hope you had a good time tonight!” We did, Eric. We did.